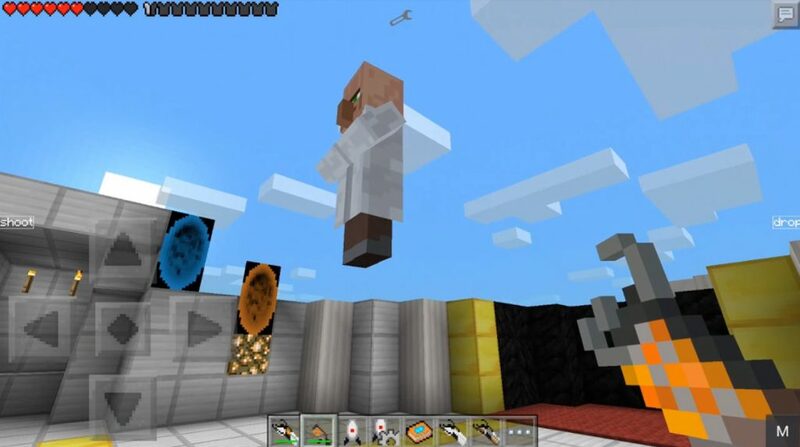 Mod Portal Gun 2 adds to the gameplay of Minecraft Pocket Edition a lot of new guns to teleport through space. With the help of these guns, you can create two different portals at different ends of the world and move between these open portals without any obstacles and efforts. 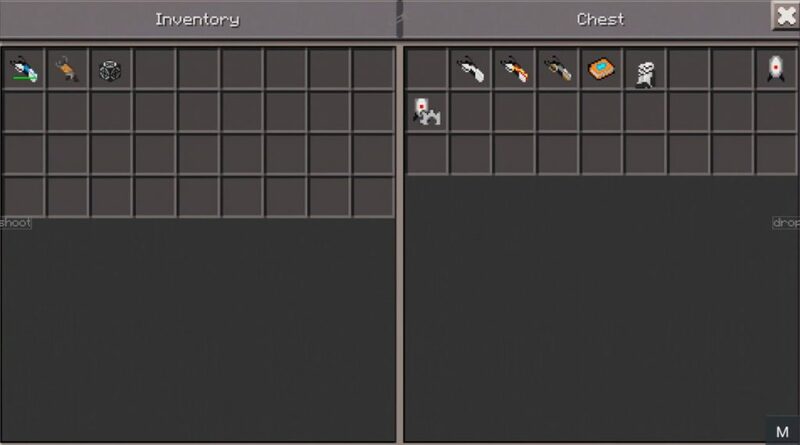 In the updated version of the modification of Portal Gun 2 Mod for MCPE 1.0.2 you can see even more weapons. Try to use also new modern types of teleport, allowing instant movement in space. There are several different types of Portal Cannons, each of which is different in its own way. In addition to the portal cannons, there are other very interesting and useful features. For example, the ability to create turrets that will protect you and which I have settings for these are robots. There is also a portal radio in the game, which you can listen to – it is very cool! You can download the add-on right now, so quickly install and start exploring new features! When you enter the world you will hear a system message that will speak on behalf of Portal Gun 2. The game has more than 5 different types of portal weapons. The game has a radio, and so there is a jumper block. 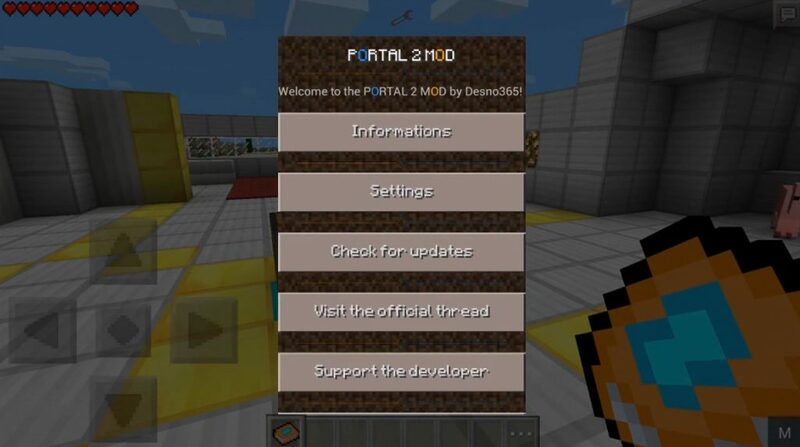 The mod has an item with which you can view information about the mod without leaving the game. Everyone is waiting for some changes in Portal Gun 2 Mod r015. But nothing supernatural happened. This is just another update of a good add-on to the latest version of the game. Well, there were some corrections. So now it will all become more stable than it was before. All functions remain the same. The main task of fashion remained the same. In general, play, enjoy. Now the addition is available to all. Make yourself any Portal-Weapon, all crafting recipes can be seen below. Then take it in your hand and you will see in the middle of the screen an oval sight, which consists of two colors, and two buttons appear on the left and right sides of the screen. Pick up the Portal Cannon and shoot the portal at a convenient place for you. For example, we installed portals at distances of more than 50 blocks. Take the jumper and put in any place convenient for you. Then stand on him, after which he will throw you very high and land without damage. Take the radio and put it convenient for you. To enable it click on it. Put the turret and take Turrets Options in your hands, click it on the Turret to open the settings where you can get the Turret parameters. You can put the turret on the mode of aggression and will throw snowballs at all enemies: Portal Gun 2 Mod 0.15.3 / 0.15.2 / 0.15.1 / 0.15.0 / 0.14.3 / 0.14.1 / 0.14.0 / 0.13.